The following is a summary of the crafting and housing related changes included in this #ESOTU patch for the PC and Mac. Clockwork City Update! Welcome to The Elder Scrolls Online v3.2.5 and the Clockwork City where you can enter Sotha Sil’s legendary creation and explore his mysterious mechanical world. In addition to new quests to enjoy, you’ll also come across two new world bosses and two delves, plus a new 12-player Trial: Asylum Sanctorium. We’ve also added 12 new item sets, two new Motifs, over 200 new furnishings, and a host of fun, new collectibles. The base game update introduces the highly-anticipated Transmutation system which allows you to change the traits on your gear, including weapons and armors. We’ve also added a trait tracker that will allow you to see whether or not you’ve researched the unique trait on an item. Additionally, we’ve also made a number of performance optimizations resulting in better frame rate and shorter loading times. We can’t wait for you to discover this mysterious, new zone. This update in its entirety is approximately 3.6GB in size. To visit the Clockwork City, you can acquire the quest to take you there by accepting it from the Collectibles/Stories interface, or by visiting the Mages Guild in Mournhold. Transmutation allows you to permanently change the trait of an item to one of your choosing! Increased the rewards for opening a Master Chest when you have the Treasure Hunter passive. Every weekend, Adhazabi Aba-daro the Golden will now sell four sets of jewelry instead of two. Two jewelry sets each weekend will be from the Overland sets, and two will be Dungeon sets. Asylum Sanctorium is a 12-player Trial located within the Brass Fortress in Clockwork City. the Asylum and Perfect Asylum weapons alter and improve the effect of one of your weapon skill line’s abilities. Over 200 new furnishings have been added to the game through various sources, many of which can be purchased through the Housing Editor or crafted. The Orbservatory Prior home is available to preview and purchase. Master difficulty chests and treasure map chests now have a greater chance of giving Buoyant Armiger motifs if you have the Treasure Hunter passive. Remains-Silent will no longer silently provide you with only a furnishing when she elects to give you one. You will now receive the furnishing alongside your normal materials for that choice. A new option for AvA Announcements has been added to the Social settings. We’ve added many new Collectibles that are available to earn from the Clockwork City area and content. (5) When you take damage, you have a 25% chance to overload your circuits, applying Concussion to enemies within 8 meters of you and healing for 1000 Health for each enemy hit. This effect can occur once every 8 seconds. Over 200 new furnishings have been added to the game through various sources, many of which can be purchased through the Housing Editor or crafted. The associated recipes and additional furnishings can be found throughout Clockwork City, with sourcing including everything from Justice activities and monster drops, to various containers and merchants. These furnishings include precision tools and small pieces of machinery from Justice activities, as well as obsolete Factotum parts from Factotum enemies. In this update, we’ve been hard at work improving the performance of the client. We’ve overhauled how the client handles animations, significantly reducing memory requirements. Additionally, we’ve made significant optimizations to the Scene Graph. Together, these two additions have resulted in significant gains in frame rate and improved load times into areas with many characters and/or buildings, including in Cyrodiil. The Orbservatory Prior home is available to preview and purchase. This Notable Home can hold 350 Traditional Furnishings (700 with ESO+), 5 Special Furnishings (10 with ESO+), 40 Collectible Furnishings (80 with ESO+), and 5 Special Collectibles (10 with ESO+), as well as up to 24 other players. 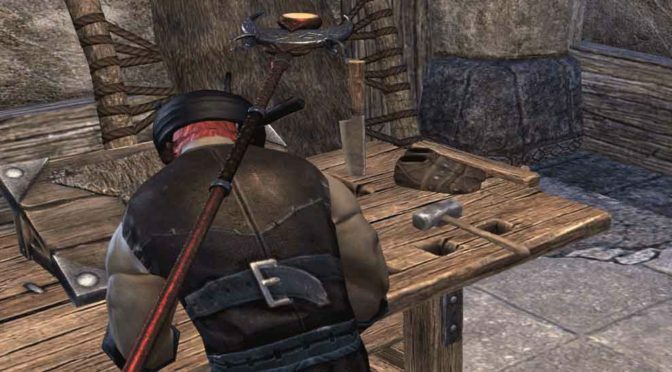 Fixed an issue where Crafting Motif 51: Hlaalu Boots could be used even if you had already learned that chapter. The note “A Plea for Help” will now appear in the Temple of Ire if you missed it in the previous quest dungeon upon completing the quest “Blood on a King’s Hands”. You can no longer accidentally gain bounty in the Kvatch Arena. Due to the fact these items can now be enchanted or poisoned normally, their extraneous stat bonuses have been removed. For example, the Maelstrom’s Greatsword no longer adds 189 Weapon Damage on top of the modifier to Critical Charge. The Master and Maelstrom One Hand and Shield Item Sets now require you to use both the One Handed Weapon and Shield together. Since the shield did not need to be paired with the One Handed Weapon originally, a brand new shield will be mailed to you for each One Handed Weapon you currently possess. Dragonstar and Maelstrom Arena will now drop weapons for their item sets in their final Arenas, in addition to their existing rewards. This means when you complete Dragonstar Arena, in addition to the rewards you already receive, you’ll now receive a weapon from the Healer’s Habit, Archer’s Mind, Footman’s Fortune, and Destruction Mastery item sets. In Maelstrom Arena, you’ll receive a weapon from the Elemental Succession, Glorious Defender, Hunt Leader, Para Bellum, Permafrost, or Winterborn item sets. These weapons will be blue-quality in Normal mode, and purple-quality on Veteran Mode. Titanic Cleave (Master 2H): This item set’s proc now increases the direct damage Cleave deals by 1500 for each enemy in its cone, up to a maximum of 9000 damage. Puncturing Remedy (Master 1H&S): Increased the heal amount from Puncture to 2500 from 2150, and it now grants you Spell and Physical Resistance equal to the amount healed for 3 seconds. Stinging Slashes (Master DW): Increased the damage bonus to Twin Slashes’ bleed to 1500 each tick from 516. Destructive Impact (Master Destro): Increased the damage bonus to Destructive Touch’s direct damage to 2000 from 516, and increased the cost reduction to Destructive Touch to 30% from 12%. Rampaging Slash (Maelstrom 1H&S): Your Low Slash will now cause your next fully-charged Heavy Attack used within 5 seconds to restore an additional 2000 Magicka and Stamina. Merciless Charge (Maelstrom 2H): Increased the damage done by this Item Set’s proc to 6000 damage over 5 seconds, up from 4300 damage over 5 seconds. Precise Regeneration (Maelstrom Resto): Increased the amount of Magicka restored by Regeneration critical heals to 800 from 481. Clever Alchemist: This item set’s proc now requires that you are in combat for it to function. Engine Guardian: The beam cast by the Dwemer Sphere summoned from this Item Set will now be hidden if your character is sneaking or invisible. Selene: Fixed an issue where the telegraph created by the proc of this Item Set would swivel toward its target. Fixed an issue that caused several crafted poisons to last the same duration whether they were crafted with three matching traits or two matching traits. Enchanting, Blacksmithing, Clothing, and Woodworking Writs now indicate that the required items must be standard (white) quality. Crafting Writs now direct you to deliver your goods to the nearest Writ Quartermaster instead of a specific turn-in site. Now that Crafting Writs can be turned in at any turn-in site, you are no longer required to have access to the Hollow City before you’re given the tier of Crafting Writ that was previously turned in. Provisioning Writs now indicate that the required recipes are available for purchase from Chefs and Brewers. Fixed an issue where the journal entry for a high ranking Enchanting Writ would claim to require the non-existent Nokude rune, instead of a Jehade rune. In a given week, she will sell either all rings or all necklaces. These will only appear in the Trait that the set’s jewelry comes in already. Overland set items are bind on equip, and Dungeon set items are bind on pickup (matching their bind type when they drop in-game). Pricing will depend on the item’s sourcing. Jewelry from Overland item sets costs 150,000g or 300,000 AP. Jewelry from Dungeons costs 250,000g or 500,000 AP (the cost of all Jewelry on the vendor at present). The jewelry will remain Gold quality and CP160, and the sourcing of Monster Mask / Shoulders are unchanged from previous iterations. Made changes to multiple lore books that were not attainable until after their associated quest is complete. The Automaton Gem, a named ring found in Darkshade Caverns, now appears in the Strength of the Automaton set instead of the Netch’s Touch set. Previously-dropped Automaton Gems will not be changed, and will continue to be part of the Netch’s Touch item set. Updated the text for the book “Anthology of Available Abodes” to be generally more informative about the abodes in question. Fixed an issue where interactable furnishings would occasionally lose their interact prompt when placed very far away from the entrance to the home. The “Redguard Brazier, Enchanted” furnishing now once again casts a blue light. The “Khajiit Skooma Bubbler” furnishing can now be lit, generating a soft purple plume of smoke. Fixed an issue that caused the “Shrub, Mountain Thistle” furnishing to appear twice in the Purchase tab of the housing editor. Stealing from wardrobes, dressers, and the pockets of Clothiers now has a small chance to award you with a furnishing version of stacked cloth or folded leather. Made several fixes to the map behavior in Hakkvild’s High Hall. A new option for AvA Announcements has been added to the Social settings. This allows you to configure when AvA Announcements, such as an Elder Scroll being returned, are displayed as center screen messages. These will now only display while you are in an Alliance War location by default, and you can turn them completely on or off as well. Survey Writ maps will now display their quickslot stack count on the quickslot action button the same it’s shown on the quickslot wheel. Fixed an issue during item improvement where the item name would not appear to have its quality adjusted after a successful improvement. Fixed an issue where the Improvement warning could persist into other menus. Fixed an issue with the camera at crafting stations occasionally being too blurry. A message will now appear when you go to the Attach Items screen in the Trade Window and you don’t have any items, rather than it being blank. Fixed an issue where your inventory count would not update immediately when un-equipping gear. Fixed an issue which could cause newly-created guilds to not have the “View Guild Bank Gold” permissions enabled by default for the guildmaster, though it could still be set manually. Fixed an issue where the “View Guild Bank Gold” permission would also control viewing item deposit/withdraw history. Guild members who do not have the “View Guild Bank Gold” permission can no longer view guild log entries for Heraldry change expenses. Bind on Pickup tradeable items will no longer appear in the sell tab of Guild Stores. Fixed an issue where Guild Store NPCs would sometimes not display their owned guild name. Fixed an issue where you could get a UI error when switching from the Guild Store to another UI screen. Fixed an issue where changing guild ranks could cause the guild bank UI to not load. You can now Filter your furnishings by theme! These themes include the various playable races, as well as a few other more exotic options such as Daedric and the new Clockwork theme. When loading permissions from another house, the dropdown menu will now scroll instead of extending off the screen.